Centre: Burning Embers, clockwise from top: Poblano, Cayenne, stunted Chocolate Habanero, Serrano, mutant from the Pobalano seed packet. 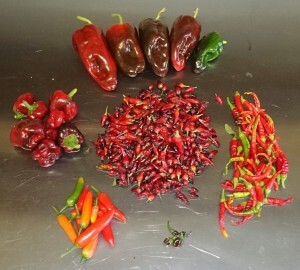 I harvested all the remaining chillies from my indoor chilli plants as they were starting to dry out a bit. 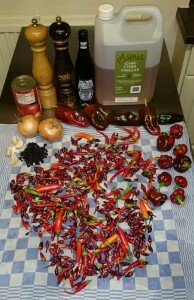 What do you do with half a kilo of chillies… well, you make chilli sauce. Obviously. We have dried chillies hanging all over the place already. 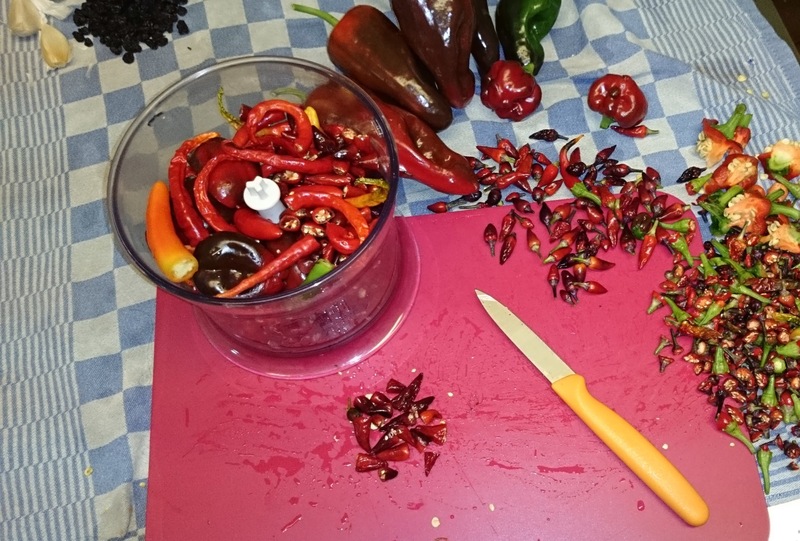 As recipes go this is pretty non-replicable due to the use of a motley collection of chilli varieties – but as a blueprint it should work for any chillies. The magic ingredient: beer with a bit of “barrel” in it. In my case Brain’s Boilermaker – Welsh Whisky-Barrel Aged IPA… a beer that I really did not enjoy very much. Not my thing at all I’m afraid. I had bought two bottles and the other one was skulking around unloved in the back of the cupboard. A distinct attribute of the beer has is a vanilla-ish whisky-oaky flavour. This, thought I, could work quite well in a sauce… vanilla-oak chilli sauce? Sorted! 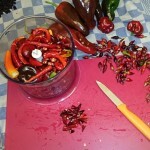 The “power” of your chilli sauce will depend greatly on the varieties used. I have mostly “Explosive Ember” (a stunning edible-ornamental), plus quite a bit of Cayenne, and a handful of Serranos and Poblanos. 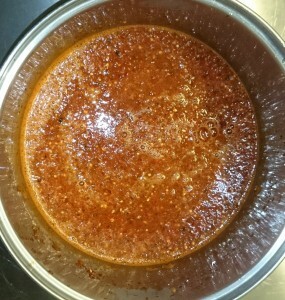 This makes what normal folk may call a “medium” sauce, it has a good bite but won’t blow any heads off. I used Brain’s Boilermaker, but there are many options out there. Any of those much-reviled Innis & Gunn beers would be interesting to try, for example. Look at it this way: it’s a cheap way to add interest! Salt – to taste, add at end – I actually didn’t bother. Simple. 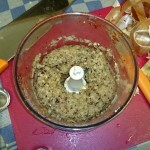 Put all the non-liquid ingredients into a food processor and “whiz” to a paste. I actually did this in two separate batches, chillies first and then the rest – because I couldn’t be bothered getting out my big food processor. 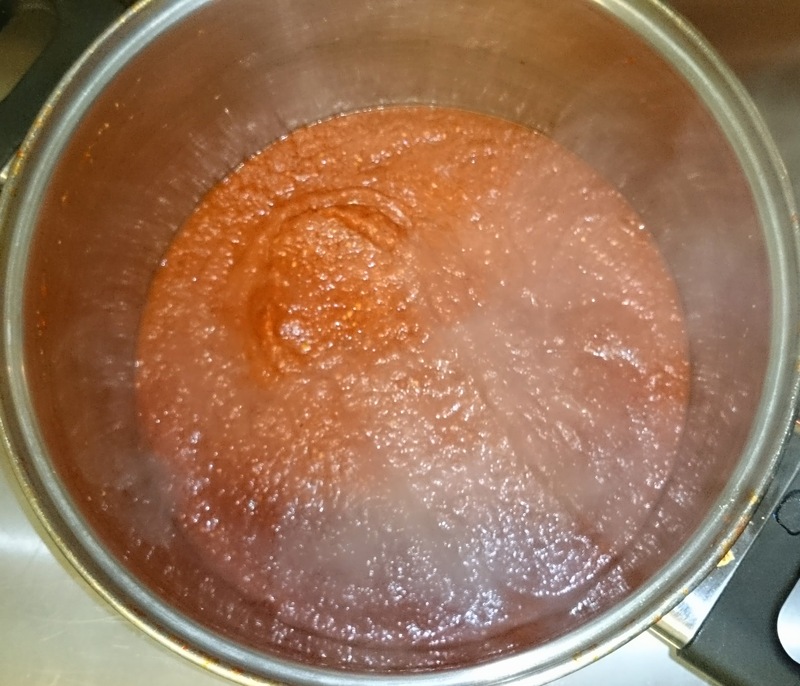 Combine the paste with the liquids in a suitable sized saucepan, bring to a simmer and simmer until a desirable “saucy” consistency is reached. This took me about an hour. The consistency is such that a spoonful will slightly heap. 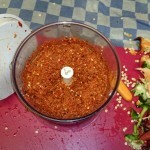 Finally blitz the sauce to as smooth a paste as possible – for this job I used my trusty stick-blender. Verdict? I was surprised how well this worked to be honest. I was a bit concerned by using such a high proportion of “Explosive Ember” chillies, which are thin skinned and very seedy. I did eat a couple whole before doing this and they proved to be pleasantly flavoured and not too bitter, otherwise I’d not have tried. 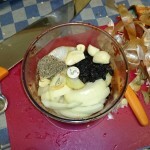 The sauce is rich, has a good kick to it, and I’m certain I can “taste the wood” – per se. The vanilla-oaky flavour that I didn’t enjoy so much in the beer works much better when translated into the context of a chilli sauce. 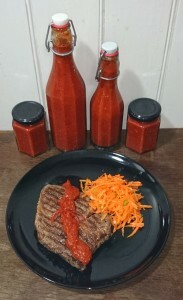 In practice so far the sauce works well with spring rolls and grilled steak. Personally I’m looking forward to slathering a burger with it, or a sausage-inna-bun. It’ll be delicious. After I had put everything into one big pot I mentally kicked myself, thinking: ah, dammit, I should have done two batches – one with beer and one with water. That way I’d be able to determine the taste impact of the beer with more confidence. This time next year… expect an update on this one! This entry was posted in Cooking, Experimental, Recipe and tagged Boilermaker, Brain's, Chilli, IPA, Oak Aged, Sauce by Yvan Seth. Bookmark the permalink.